Since arcades were big things then the home games that got to use the arcade names were very popular. But with few exceptions like breakout, the home console did not have the power of the real thing. The programmers learned some real nifty tricks with the hardware. Just look at this screen shot from a game called turmoil. 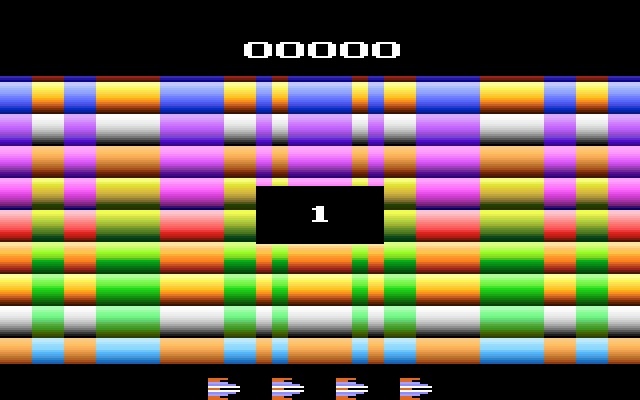 All those colors on a home video game. In today's hardware you could do this without blinking by pallet rotation. The Atari did this by changing the display properties of each scan line of the TV. This is a concept today's programmers don't deal with. Writing code to execute in the time it takes the scan to get from the right side of the screen to the left for the next line. Most games were twitch games where the object was to score as many points until you lost all your lives. It wasn't until adventure that the concept of finishing a game was introduced. I can still remember that feeling 3 hours after the first time I started playing it and beat the first level. And again after each time level 2 and 3 was played. One of my systems that I keep unpacked is my 7800. This way I can play a few of my favorite 2600 games as well. Next to my machine is. 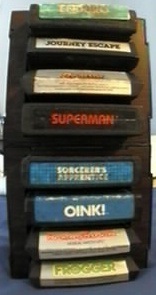 The oink, sorcerers apprentice, and strawberry shortcake are there because my kids like watching them get played. They like Frogger too but so do I. Reactor, enduro, Journey escape, and superman were just the ones I play the most. And also an adventure cart but that is missing the labels. 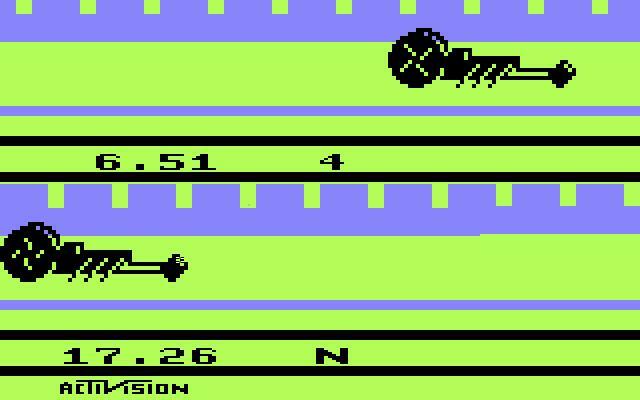 Another of my favorite old time games is Dragster. Unbelievable simple control but hard to master. You had to have the perfect finger twitch timing. I played this game with my cousin the first week he had it till my hand cramped up. I think this might be my best score also. people hated strawberry shortcake on the Atari.